FM-200 ® is accepted and respected worldwide, with a history of protecting some of the world’s most critical and irreplaceable assets. In fact, FM-200 ® is in use in over one hundred thousand applications, in more than 70 nations. Many fire suppression systems can cause major damage to – and even destroy – the very things they are supposed to protect. You’re looking to avoid damage – not cause it. You’re looking to reduce downtime – not lengthen it. You want a fire suppression system that deploys quickly and cleanly and won’t leave behind oily residue, particulate, or water. FM-200 ® fire suppressant stops fires fast. When you consider the potentially devastating environmental effects of an uncontrolled fire, it’s easy to see that an FM-200 ® system is an important part of an environmentally responsible fire suppression solution. FM-200 ® systems reach extinguishing levels in 10 seconds or less, stopping ordinary combustible, electrical, and flammable liquid fires before they cause significant damage. That’s the fastest fire protection available, period. When fire is extinguished this quickly, it means less damage, lower repair costs, and an extra margin of safety for people. It also means less downtime and disruption of business. FM-200 ® fire suppressant can be safely used where people are present. 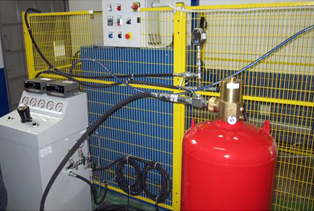 In applications where space is at a premium, FM-200 ® fire suppression systems are the superior choice. The FM-200 ® agent is stored in cylinders as a liquid and pressurized with nitrogen, saving huge amounts of storage space. In fact, for the same amount of protection, FM-200 ® systems take up to seven times less storage space than systems based on CO2 and inert gases. You cannot afford to settle for minimum fire protection when lives and valuable assets are at stake. There’s no substitute for genuine FM-200 ® waterless fire protection. Наличие заправочной станции «OSK GROUP» способствует расширению качественно нового делового сотрудничества со всеми потребителями в области пожарной безопасности во всех регионах России и странах СНГ и дает мощный импульс для дальнейшего развития и совершенствования. Вам необходимо организовать заправку модулей пожаротушения ГОТВ FM-200 ® (HFC-227ea, Хладон 227ea) — позвоните по телефону +7-495-785-55-01, «OSK GROUP» — российский производитель АУГПТ FM-200 ® (HFC-227ea, Хладон 227ea).